Begin by placing the vinegar, water, salt, and sugar in a saucepan. Bring to a boil. When salt and sugar are dissolved, turn off the heat and let the mixture cool. Place 1/2 of the garlic, dill, and pepper flakes (if using) in the bottom of each your Mason jars. Pack in the cucumber pieces into each jar, almost to the top. Fill the jars with the cooled vinegar mixture, covering all of the cukes and over them by 1/4 inch. Cover the jars and put a date on the top. Store in the refrigerator. Lightly swirl the jars once daily. 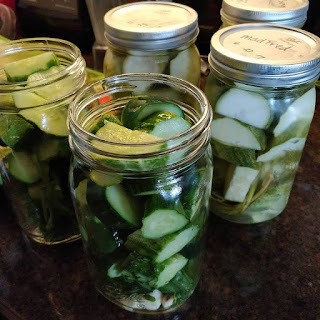 The pickles should be ready to start eating in 3 or more days.